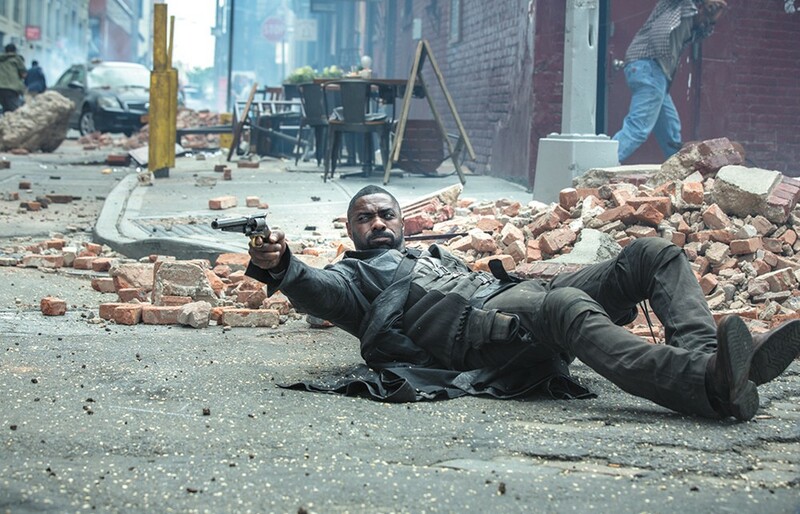 The Dark Tower has lots of ammunition but doesn't hit any of its targets. So there's this tower at the center of our universe, and it's so tall that it seems to shoot up into the sky forever. It is, according to The Dark Tower's opening text, the only thing protecting the human race from decimation by the forces of evil, though we're also told that "the mind of a child can bring it down." How powerful can it really be, anyway? And then there's this gunslinger, who can do amazing, physics-defying things with his six-shooter. He's engaged in the never-ending pursuit of the devilish Man in Black, who wants to destroy the tower and therefore slaughter all of humanity, so he kidnaps telepathic children and straps them into these bizarre torture chairs that will harness their brain power, which shoots straight out of their heads like bottle rockets on a bender. Why does he want to topple the tower? Well, because he's the bad guy. Stop asking so many questions. That's the sketchy setup for The Dark Tower, inspired by Stephen King's epic, cultishly adored fantasy series, published over the course of two decades, spanning more than 4,000 pages and connecting the dots of a vast mythology within the prolific author's body of work. This movie, by comparison, runs a paltry hour and a half, which turns out to be something of a catch-22: There's no way to adequately establish the ins and outs of such a massive universe in a mere 95 minutes, but I'm also glad that I didn't have to endure this movie for any longer than I had to. It's set both in contemporary New York City and an alternate dimension known as Mid-World (I don't remember whether it's actually referred to by name), which recalls old Westerns with its shantytowns and craggy, desolate landscapes. Into this godforsaken place comes a troubled Earth kid named Jake Chambers (Tom Taylor), who finds a portal into Mid-World inside an abandoned house in Brooklyn. He's been having visions of death and mayhem and scorched earth, and now he's come face to face with gunslinger Roland Deschain (Idris Elba) and the Man in Black (Matthew McConaughey), who he's been seeing in his nightmares. The MiB wants to harness Jake's telepathic powers (his "shining," if you will); Roland serves as interim bodyguard. Elba will never not be a magnetic screen presence, though he has nothing to work with here. McConaughey, meanwhile, is as oily and laconic as he's ever been, vamping about in a high-thread-count shirt that's always unbuttoned to his sternum. If he's ever supposed to be genuinely threatening, it doesn't come across: One of his more intimidating moments has him sneaking into Jake's mom's apartment to cook himself some chicken. It's no secret that The Dark Tower has had a troubled production history. Both J.J. Abrams and Ron Howard (who's still listed as a producer) were set to direct the film at different points, though the reins were eventually handed over to Danish filmmaker Nikolaj Arcel, who seems completely out of his depth here. Several of the movie's biggest set pieces are so physically dark that it's hard to see what's going on, and they're often resolved so abruptly that you start to wonder if a pugnacious editor took scissors to them out of sheer spite.